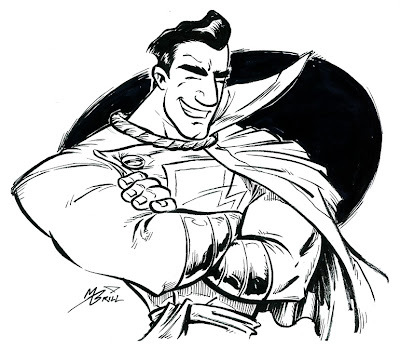 When I heard that Mike Kunkel was going to do "Billy Batson and the Magic of Shazam", I was really hyped. I LOVED "Hero Bear and the Kid". I love his style and just the pure joy he puts in to his artwork. Not to mention the fact that I always loved Captain Marvel when I was a kid. I mean, what kid wouldn't want to be able to say a magic word and turn into a full grown super hero?! Needless to say, I got the issues he drew and got the trade paperback when it came out as well! It was beautiful! Anyway, here's my tribute to the Magic of Shazam! Sort of with the Mike Kunkel look, at least as much as I can manage! This drawing took about 30 minutes...but I've been kind of exhausted this week and frankly, I wasn't trying to hurry it too much! I almost took a marker to it for shading, but decided not to. I really liked the way it turned out, so I might do digital color on it at some point and make a nice finished piece out of it!